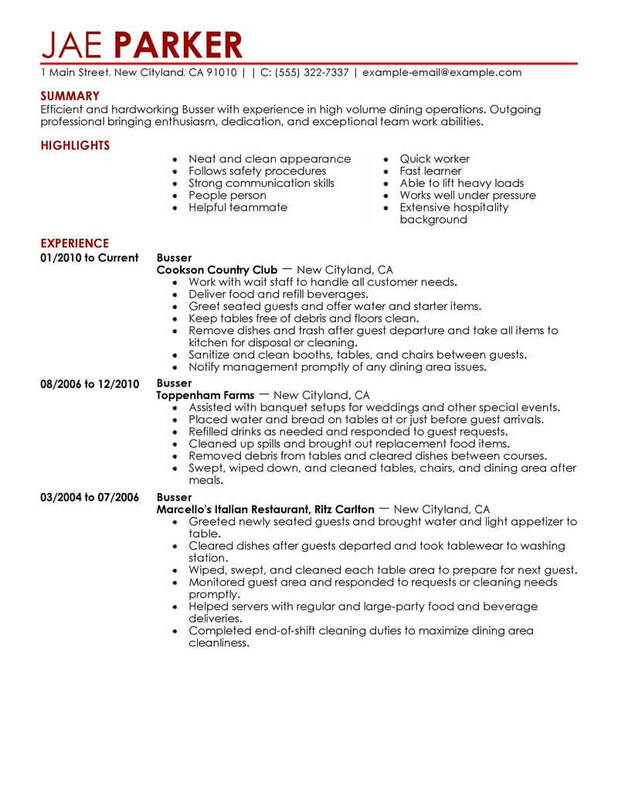 Just because a busser is typically an entry-level position, doesn’t mean you should do a turn and burn job on your resume. Tobe competitive, your resume should highlight the following: reliability, the ability to think quickly, being able to thrive in high-pressure situations, and the ability to work well with a team. In your work history section, share accomplishments related to these traits. Write a strong summary statement that draws attention to these talents, even if you have little to no work experience. Follow it with a robust skills section. 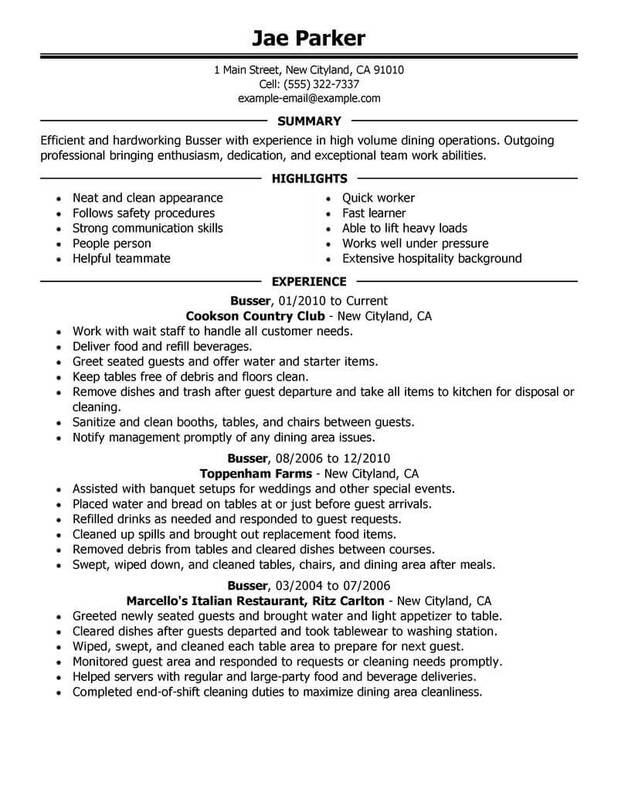 To get more ideas, tips, and guidance read through our busser resume example. Jobs as a busser are plentiful–there are opportunities to work in a variety of settings, from catering companies to hotels to cruises and more. 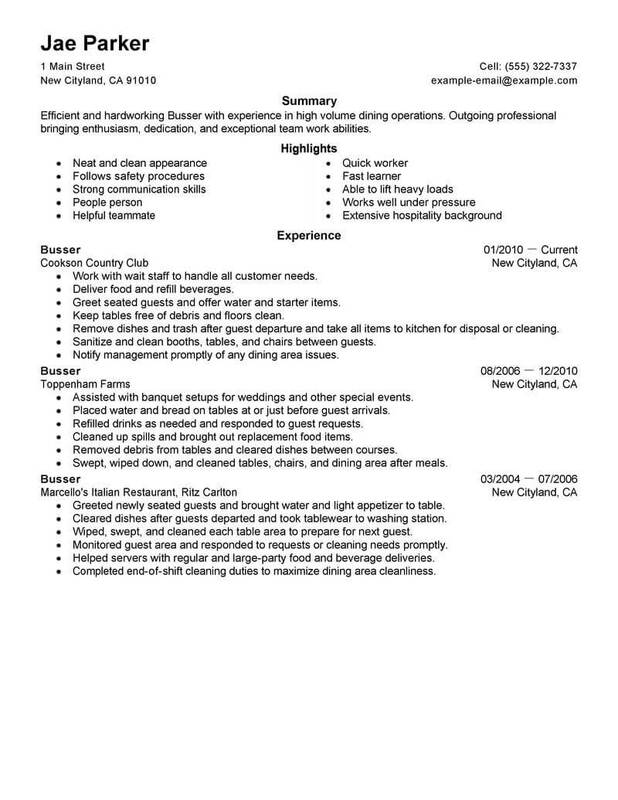 These resume examples make it easy to get started on building your own busser resume. Choose from multiple design template options, and click on any of the samples below to get started. With help from these resume examples, you can improve your resume, and put yourself in position to get a new job faster. There are many job opportunities as a busser; however, the job search as a busser can be made significantly easier by taking the right actions to reach out to potential employers. 1. Visit Potential Employers in Person – Even if you’re not meeting with anyone who will make the final hiring decision, it never hurts to make an in-person connection with some of the people you may be working with if you get the job. 2. Follow Up with Hiring Managers – Hiring managers as a busser get multiple applications and resumes everyday, so don’t be afraid to send a quick follow-up email if you don’t hear anything within a week or so after your first contact with a potential new employer. 3. Coordinate Your Social Media Pages – Make a good first impression with all of your social media pages by ensuring that you’re delivering the same message and tone. Delete or edit any pages that convey a less-than-professional image. 4. Automate When Practical – Save time and automate when it’s practical by including your resume with online messages you send to potential employers as a busser and focus your efforts on networking and generating job leads. 5. Be Persistent – Combine your social media presence with personal connections while also checking job boards frequently and following up on leads. Such persistence will eventually lead you to the right job. It’s great to be confident that you’re a prime candidate for the job you’re seeking. Yet the key to connecting with potential employers as a busser is an effective resume. Regardless of your experience, skills or qualifications, there are some dos and don’ts to keep in mind when preparing your resume. 1. Do Submit Personalized Versions of Your Resume – While the basic structure of your resume can remain the same, the content should be adjusted to highlight the qualifications and skills specific to each employer. 2. 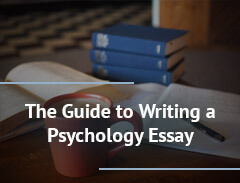 Don’t Panic If You Have No Practical Experience – If you’re fresh out of college, it’s alright to draw from relevant coursework and emphasize transferable abilities like computer skills on your resume. 4. Don’t Make It Difficult to Contact You – Make it as easy as possible for a potential employer as a busser to contact you by including one email address and a single phone number, both of which you should use and check on a regular basis. 5. Do Include a Concise Summary Statement – Busy hiring managers appreciate anything that makes the process of sorting through resumes easier, so include an eye-catching summary statement that briefly summaries your main qualifications while providing an incentive to read further.